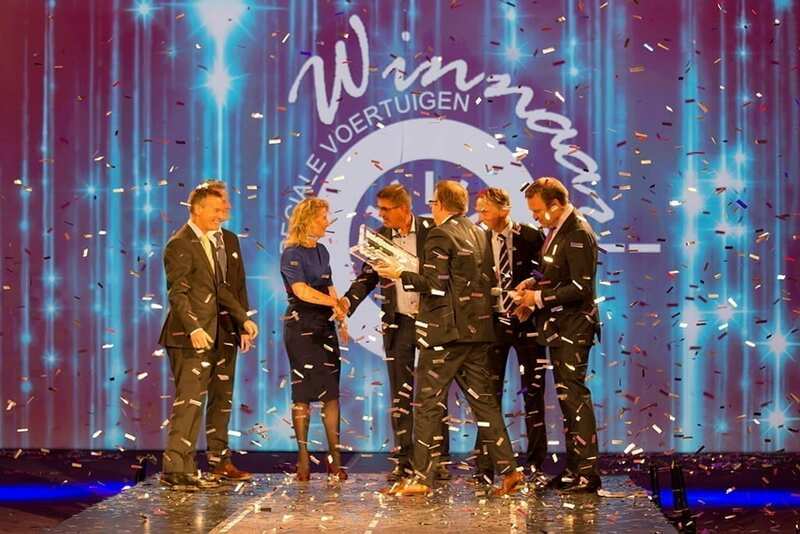 Royal Nooteboom Trailers has won the SV Innovation Award 2015. According to the panel of expert judges the MANOOVR has scored the highest, particularly in the category ‘innovation for the user’. 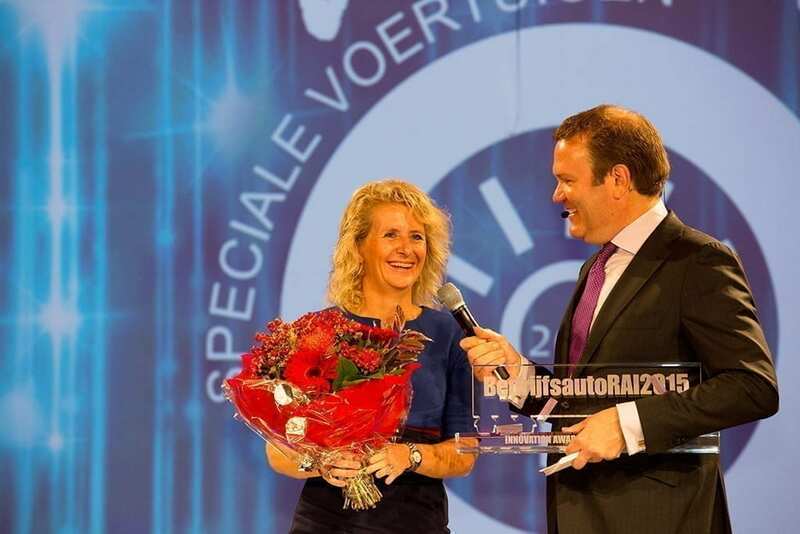 The award was presented by Jarco the Bruin, commercial director ING Lease Nederland, to general manager Marinka Nooteboom during the opening of the BedrijfsautoRAI 2015. The SV Innovation Award is an initiative of the Special Vehicles department of the RAI Vereniging and is sponsored by ING Lease. The MANOOVR semi low-loader has a newly developed suspension system which makes it possible to have an ultra-low floor height of 780 mm with a rated load capacity of 12 tonnes anywhere in Europe. The axle travel, steering angle and low axle make this semi low-loader extremely efficient and will save money on e.g. the tyres. The MANOOVR is available with 3 to 10 axle lines. For the SV Innovation Award the emphasis is on a proven pursuit of technical innovation. The degree of innovation of the entries is assessed using the criteria: durability, market potential, innovation, safety, ergonomics and environment. When judging the 14 entries the jury laid emphasis on the benefit of this innovation for the user. The jury finds the MANOOVR of Koninklijke Nooteboom Trailers to be the best example of technical innovation: every axle is mounted on the trailer with a newly designed tower bearing. Consequently the bearing of the pivot point stays between the wheels while the forces are still distributed in the chassis. This construction makes it possible to have an extremely low floor height. The combination of a high legally permitted axle load of 12 tonnes, with a for pendle axles unique low load floor height of 780 mm, offers specific advantages for operators in abnormal transport. The market potential of this axle concept in the niche of semi low-loaders is significantly increased. Finally the transport operator profits greatly from lower running costs due to the low weight and claimed reduced tyre wear.